Do I need this firmware update? Added Omni channel as an available MIDI channel for USB MIDI. Changed X and Y buttons to send their lowest set value when pressed (00), and their centered value (64) when pressed with SHIFT. In general, the firmware for any keyboard should only be updated in order to resolve specific issues as addressed by the firmware update or to add any new features offered by the update. If you are experiencing issues that are not addressed specifically in this update, reach out to the Technical Support Team for further assistance. Ensure that the keyboard is plugged directly into a free USB port on your computer. Avoid using any USB hubs, adapters, extenders or long USB cables to prevent any lost data during the update. Unplug any MIDI cables plugged into the MIDI ports on the keyboard. Make sure that the downloaded Firmware Updater is properly unzipped or extracted before installing the updater. In general, your Code should have a consistent and working connection to your computer in order to install the firmware. If you are experiencing any of the symptoms like the ones listed below, do NOT attempt to update the firmware in order to remedy this. Some of these symptoms can be resolved by going through some of our troubleshooting guides below. If this doesn't help and you need further assistance, contact the Technical Support Team and they'll be able to assist. Find the Install_M-Audio_Code##_FirmwareUpdater_1.2.3 zipped folder and extract all the files. 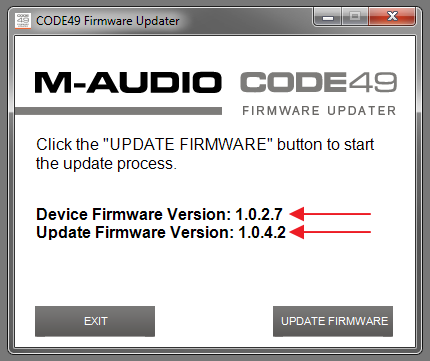 Double-click on the Install_M-Audio_Code##_FirmwareUpdater_1.2.3 file (## is the number of keys on your model). Wait for C++ to update (this may take several minutes). Connect our Code keyboard to your computer's USB port and ensure it is powered on. On your computer, click the Start Menu and select Code## Firmware Updater. You can also find this in your Programs folder, inside the M-Audio folder. Check the Device Firmware Version vs. the Update Firmware Version. If these are the same, you are currently running the latest firmware version and will not need to continue. 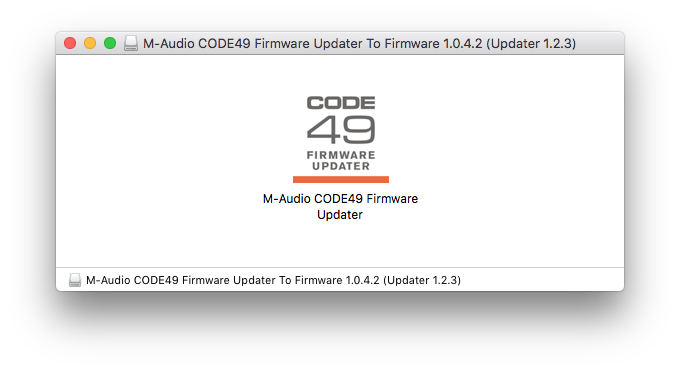 The 1.2.3 Updater Application will update your Code firmware version to 1.0.4.2. Click Update Firmware to start the update process, and then follow the on-screen instructions. Once the update is finished, click Exit. Congratulations! Your Code keyboard now has the latest firmware! Use the default CODE## preset on your code keyboard to connect with the mapping in the VIP software. Connect your Code keyboard to your computer's USB port, and ensure it is powered on. 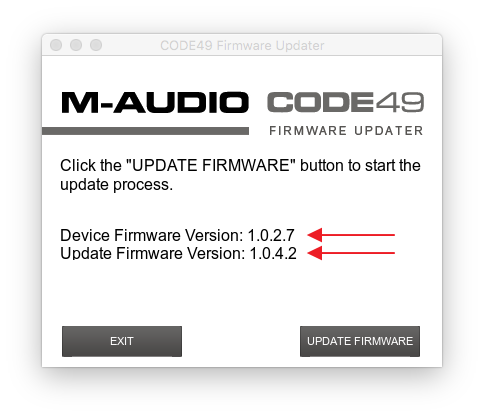 Double-click on the M-Audio Code## Firmware Updater application (## is the number of keys on your model) in the window that appears after opening the installer.